The Duck® Standard Tape Gun features an adjustable tension control knob and has a comfortable handle so it's easy to use. 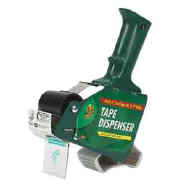 This handheld tape dispenser is lightweight, easy to use and made from metal, so it will last. Holds up to 2"-wide tape.